that balance the perfect amount of power at the right price! Whether you are running a pair of COMP 10" or 12" subwoofers or a pair of component speakers a 2 channel stereo amp has the power you need. 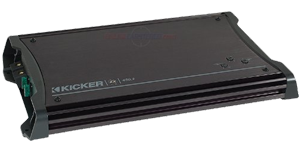 All Kicker 2CH amplifiers include a built in crossover and can be used to drive a full range, high or low pass stereo system.